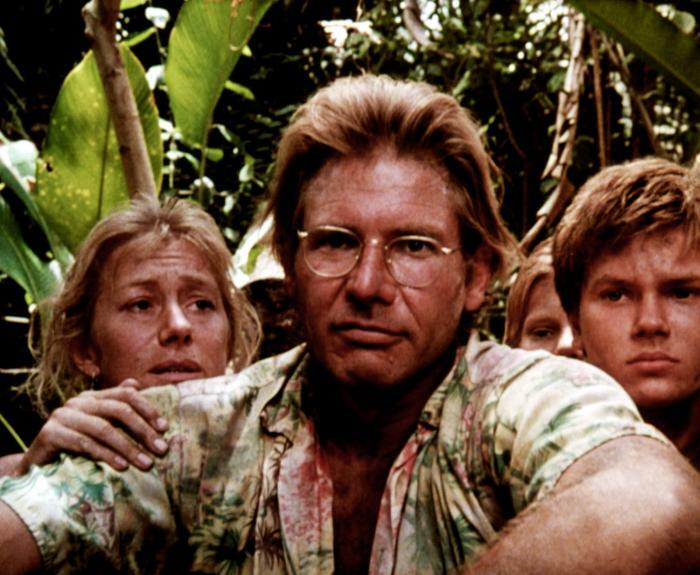 More interesting than good, The Mosquito Coast tackles a descent into insanity and throws in a few opinions about the eternal battle between religion and science. The film occasionally engages the brain but never the heart. Allie Fox (Harrison Ford) is a barely employed inventor specializing in innovative refrigeration devices, and convinced that the United States is headed for a rapid and catastrophic decline. Allie packs up his wife (Helen Mirren, referred to only as "Mother") and four kids, including young teenager Charlie (River Phoenix), and they board a boat headed to Belize. On the journey they meet Reverend Spellgood (Andre Gregory), a missionary also heading to Belize with his family, including daughter Emily (Martha Plimpton). Allie immediately despises the Reverend, but Emily has eyes for Charlie. In Belize, Allie purchases the rights to a tiny village called Jeronimo buried deep in the jungle area known as the Mosquito Coast. He sets about building a new society from scratch and improving the infrastructure to the bewildered delight of the locals. As his crowning achievement, Allie builds a massive ice-making machine, which changes the fortunes of Jeronimo, introducing food storage capability and an ice export industry. But Allie's opinion of himself is rapidly expanding, and his hubris ultimately triggers a downturn in his fortune and that of Jeronimo. As madness creeps in, Allie starts to endanger all that he has worked to build, including the trust of his family, and he hurtles towards another unplanned confrontation with the Reverend. Paul Schrader adapted the Paul Theroux novel, but was unable to conjure up any sympathetic characters to hang the story on. Allie Fox is brilliantly inventive but also cranky, whiny, and self-absorbed, never pausing to consider the implications of his impulsive actions on his perpetually suffering family. His downward spiral towards arrogance-driven self-destruction evokes no sympathy, just confirmation of the obviously predictable. 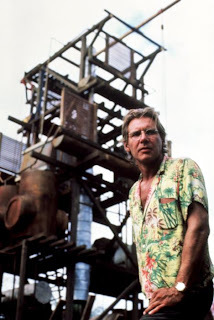 Harrison Ford is fully engaged with the character and works well with what he has, but fails to generate the warm connection necessary to trigger caring. Helen Mirren and River Phoenix have little to do except be victimized by Allie's erratic actions, and the roles of Mother and Charlie barely evolve throughout the movie. Both take forever to decide on any sort of a stand against the massive disruption to their lives caused by Allie, almost to the point of deserving their fate. Director Peter Weir creates a hectic and dense jungle environment for The Mosquito Coast, the external surroundings mirroring the endangered beauty inside Allie Fox's head. Weir's pacing is slow and deliberate, in a story where ultimately relatively little happens. The tension between science and religion is exposed sparingly, and this is an area that The Mosquito Coast could have exploited more fully to prod the drama along. The intellectual conflict between Allie and Reverend Spellgood sparkles in the few scenes where the issue bubbles to the surface, but unfortunately the debate and its implications are never sufficiently sustained. It's not easy capturing a mind stepping over the boundary of rationality and into the incomprehensible quicksand of madness. Weir works well with Harrison to make the most of it, but in The Mosquito Coast the abnormal behaviour is relatively obvious from the start and trips up any opportunity for empathy: the characters take just a bit too long to recognize the obvious.